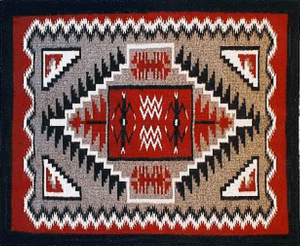 The Navajo women weave some of the finest quality rugs in the world. A Navajo woman normally starts a rug by raising the sheep for the wool. The sheep are sheared in the early spring. Most Navajos still use metal hand shears. After the wool has been sheared from the sheep, it must be hand cleaned, to extract any twigs, burrs and gravel that is in it. The wool is then washed by hand and dried in the sun, usually over rocks or sticks. After it is thoroughly dry, carding brushes are used to get out all the knots. It is additionally brushed until it is completely straight. The women spin the carded wool on a portable hand spindle, easily used anywhere. The spindle is made from a with a pointed dowel or stick inserted through a small wooden disk. With spindle in the right hand, wool in the left, the yarn is spun many times to a consistent width. The more times it is spun, the finer and smoother the yarn will be. If the yarn is to be dyed, it is dyed at this stage, with either vegetal or alkaline dye. 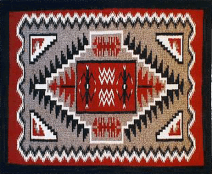 Commercial yarn was introduced into Navajo weaving in the 1860s and has continued to gain popularity with the weavers since then. The Navajo weave on an upright loom. This allows tighter packing of the weave, which increases its durability. The loom is made of two upright wooden pieces and two crosspieces. This loom must be completely rigid in order to weave a straight, even rug. The weaver begins at the bottom of the loom. With a mental picture of the rug, the weaver, sitting on sheepskin, goat skin, pillow or blanket, works on the weaving until it is as high as she can reach. The top and bottom bars are then readjusted to bring the weaving down to a workable height. The bottom of the rug is then hidden and the weaver must rely entirely on her mental image to complete her rug properly.